I can’t believe that the holiday season is upon us but alas, here we are one week away from Thanksgiving. I don’t know about you all but I love having a go-to quick bread recipe on hand during the busy holiday season. 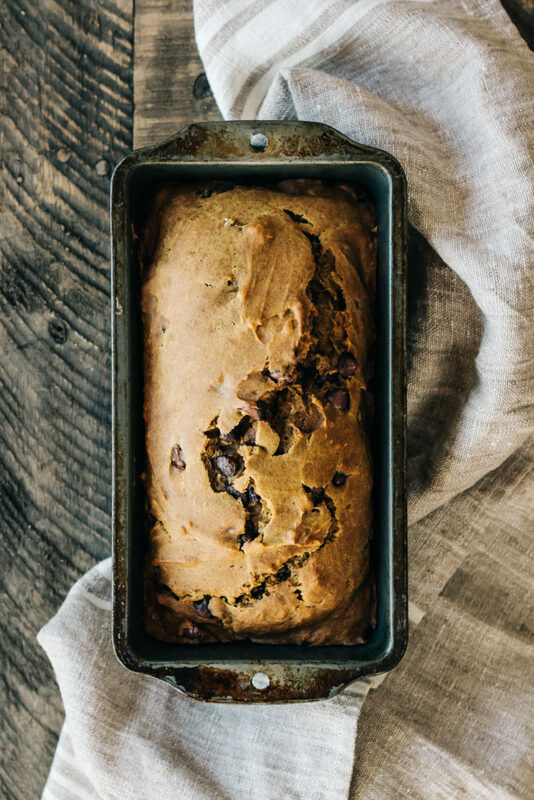 This tasty loaf was a great way to use up a small portion of our winter supply of kabocha squash. Kabocha is perfect for baking because it’s one of the sweeter winter squash varieties. However, if you can’t find kabocha feel free to substitute with pumpkin, butternut, or even one of those beautiful (and giant!) blue hubbard squash. This is a great opportunity to cruise your local farmers market for storage squash anyway to keep on hand for the long winter ahead! This particular recipe is lightly adapted from Amy Chaplin’s cookbook ‘At Home in the Whole Food Kitchen‘ and uses spelt flour instead of all-purpose. I loved how light tasting the bread was with spelt flour and the addition of dark chocolate chips made it feel just “naughty” enough to have around during a season when we’re indulging a bit more. Amy’s original recipe called for a cinnamon walnut swirl but I was fresh out of walnuts so I subbed with chocolate chips. I was really happy with how this turned out and hope you all love this bread as much as we do. Our favorite way to serve this up is sliced into thick pieces, toasted and then smeared with a healthy amount of good quality butter. Pair with coffee or tea for a perfectly delicious morning treat. Place chocolate chips, cinnamon, brown sugar, and maple syrup in a bowl; mix to combine and set aside. Steam the squash for 10-12 minutes or until soft. Place in a medium bowl and mash with a fork. Measure out 1 1/2 cups and set aside. Preheat the oven to 350F. Lightly oil a 9 inch loaf pan and set aside. Sift spelt flour and baking powder into a medium bowl and stir to combine. Add olive oil, maple syrup, milk, salt, vanilla and egg to the mashed squash; whisk until smooth. Using a rubber spatula, fold flour mixture into squash mixture until just combined. Spread half of the batter over the bottom of the loaf pan. Layer the chocolate chip cinnamon mixture evenly over batter and top with remaining batter. To create a swirl, use a small rubber spatula or butter knife to zigzag back and forth through the batter (across the pan) and one stroke straight through the center of the loaf (lengthwise). Place in the oven and bake for 45-50 minutes or until a toothpick inserted in the middle comes out clean. Remove from the oven and allow the loaf to cool for 5 minutes in the pan before turning out and placing on a wire rack. Would it be possible to swap in an all purpose GF flour for the spelt, such as Bob Red Mill’s 1 to 1? I haven’t tried this recipe with all purpose flour but I think that should be just fine.